Welcome to another article of "welcome to the master plan" (which was adapted from one of adam lambert's songs which is damn nice, i actually wan put it on the music player here but then scared other ppl dont like adam) Ok enough with that I sound like Oprah or a radio announcer. Last night as I was browsing the blogs, I came across the Perplexed Duelist's post about some flame wars at Shriek. Lucky I go read or else I would never have discovered this deck. You go read his blog la and see the whole story. So, as I was browsing the comments on Shriek, i noticed that there is one deck which really is good, innovative and catches my attention. You see, Jhonn Paul Santiago may have only made it to 6th place, but his deck idea is awesome actually. Look at the build. At first you might not know the genius behind this work of art. Actually you have to look at a new perspective for this deck. Think about it as 2 decks combined in one. Firstly, is Blackwings. Which is nothing new and plain ordinary so i will skip the parts about BWs bla bla. Now to the extraordinary: look at the deck as if its a turbo deck and an engine. Okay actually the deck is just another BW deck but it has the potential to turn into a crazy return turbo engine. Let me show you how. 1)It completely negates the effects of Book of Moon, opponent's own God Bird Attack (which I "LOVE"), and the annoying Bottomless Traphole. That way you can tribute off the card to put another BW in grave which can be useful for Vayuu. 2)Its a way to put Vayuu into the grave! Easy as you can just summon Vayuu, tribute it for Nest and special summmon another Vayuu. That way, it can serve as a defence then later be used for synchro summon. The Vayuu in your graveyard can be used for the usual BF swarm crap. 3)It puts one more dark monster into the grave (preparing it for Dark Arm Dragon or puttin another dark for The Dark Creator) You can normal summon a BF, and if you have a vayuu in the grave along with another dark in it, use Nest's effect to sac ur BF on the field and then special summon another one to the field. Then call out Dark Arm dragon, syncrho summon by removing Vayuu and the BF in the cemetery and with that you end up with a DAD, a synchro monster, a BF (special summoned by Nest) and a dark in grave to remove for DAD's destruction effect. Sweetness. 4)End the game. If you can finish your opponent off till he has just a few life poitns left, Jhonn can play Swallows nest and summon a BF from his deck to finish the game. Now, this deck runs a very weird card choice in Shadow Preist OHM obviously. But what people dont know is that OHM is a very good card choice in the right deck you see. BF is a fast swarming deck and can put many cards on the field. Ohm can take advantage of that and become a Dark Dive Bomber (obvsiously not as good as the ori one). Ohm can also tribute monsters to end the game. 800 damage per monster is quite a lot as its 1/10 of your lifepoints. And with BF's ability to swarm swarm kill kill so easily Ohm can end the game faster than you think. all togther. In fact u will get many options and possibilities to do handle every single problem your opponent throws at you. The beauty of this deck is that it can simply change from a turbo deck to your standard BW deck. Reckless Greed adds combos that you need to your hand: while recreating the first few ever-created versions of the BW deck. This is just the basic skeleton of a new deck that might change BWs forever. They are fast and can act as a great turbo. Tweak the deck the way you want and create a one of a kind BW deck. What Jhonn Paul Santiago has founded is not a failure of a deck with random tech like what those people at Shriek has commented, but actually a masterpiece that can become the BW deck of the next generation. Oh yeah its at 42 cards. Really dunnno what to take out. No posts for today. Hopefully tommorrow will remember what I wanna post. Training with squash racket for 3 days in a row is not fun. Pain till high heaven. You see, Eatos dimension is like all other anti-meta decks and are inconsistent. Basically, if you do not have Skill Drain or your key cards, its very true that you will die to Gyzarus, Celestia, and Judgment Dragon etc. Therefore, it's there to solve those problems and add field presence in the form of a big white beatstick. Neat huh? Why? Your oppponent has lost his big kickass monster and now needs to deal with a Stardust and is hopefully stalling his way out or setting up for a combo. Gemini's spark helps you destroy whatever your opponent is trying to turtle through with. Then you draw. And draw again next draw phase. Which leaves you to gathering your Skill Drains. There. Pro huh? 6) Some old Blue Eyes White Dragons that have the picture of the one Kaiba use in anime. Common or rare=fine. If low on cash, will settle for commons only. 7) Some Promo cards like Tyrant Neptune, Atmosphere etc. Buy in pack better n cheaper de. Card Trader- solves the inconsistency. Just 15mins ago, I was dueling friends with D.D Eatos. As you know, it is really hectic to play against this deck but I was in for a surprise. My friend used GBs and it was swiftly taken down. Proxied Blackwings- 3/3 won (burden makes them so small...) dn't need to play with Lightsworn as the outcome was obvious. BUT, then I played against Synchro. Really no face ah. Score stood at 3:2. He won 2 games from Creature swap! My deck just drew inconsistent repititions of Dimension Fissure, Skill Drain etc and my Eatos beat me to hell =.= When I played the first game against that deck, I couldn't even draw ONE out play card as all my Macro and d.d fissures are down there =.= So he stall by Collosal Fighter. Lastly, used trunade then flip Jar and deck him out. Too cool. But what bugged me was the inconsistency. I stopped playing DDGB for standard GB (seriously it works much better and is so much more consistent- DD fissure can be sidedecked bah) I've been playing Meta decks for the past how many formats since Monarchs. This time is exception as I stopped halfway for PMR bah so I didnt get to collect the Black Feather or Lightlord cards. 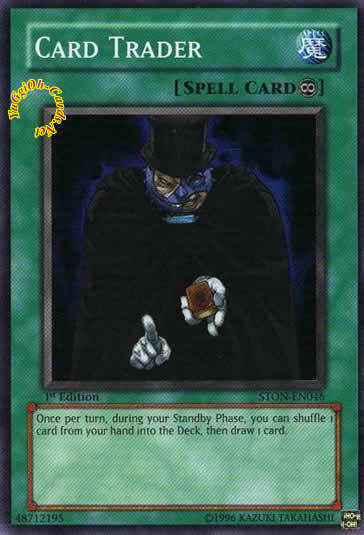 Then suddenly it hit me as one of my friends used a card to solve his old Cyber deck's consistency. What card was that? Card Trader. This card lets you switch one card for another. Yes it's that useful and in anti meta the inconsistency and the repitition of Macro, Skill drain or any sort key cards is just horrible! Can't stand ah. If we run Card Trader, we not only solve the inconsistency, we get to draw the key cards. Face it, in anti meta you always come into the situation where you have to topdeck and sometimes you need a monster but you never get it. The same goes as you sometimes want to draw that Smashing or Fissure but all you draw is useless Raious or DCKs! Its too horrible. Then again, you CANT reduce the number of your key card (eg: skill drain deck must play 3 drains) or else you wont see it as often in the game. Think about it. Cut 2 cards just to run JUST TWO card traders and cut that inconsistency rate. Yes, its that simple. I know the inclusion of such a random card and "never before heard of this idea its preposterous!" card sounds bad and you might not be able to accept it soon, but take it from here: Card Trader HELPS. Yes, you are doubtful! Card Trader is also a spell card and like all other spells/ traps its vulnerable to Breaker. So? Let your opponent waste his card on Trader. That way he cant rid your DD Fissures. Yes. If he destroys fissure, I can just use Trader next turn to hopefully test my luck at 4 more cards (1 Jar, 2 fissures, 1 Macro) How's that for foul play? If D.D Eatos can incorporate this card into the deck, it might just solves many problems out there. I'm gonna proxy 2 and get them somehow and let you guys know of the result. Maybe I need 3? I also dunno. But Card Trader is just the card for anti meta. If you draw another useless card, well goes the old saying "Not everyday is a sunny day" and "every dog has his day" so next turn you can just win it. Actually Hopeless Dragon is not a bad deck idea you know. It can easily take out alot of decks with Phantom of Chaos plus Norleras. If you do so, the game will be reset and you can draw a card puttin you at a +1 in terms of card presence. Next turn opponent draws out something. Surely it cant do anythin what. Is it a monster? I just remove my Wyvern and swarm with Red Eyes Darkness Metal dragonn the boss monkey. If he is so lucky that the card is Bottomless, fear not, I have another Wyvern in grave to do the nightmare again. Is it a spell he just drew? Nothing one lah. For once Im happy Blackwings get their Whirlwind. 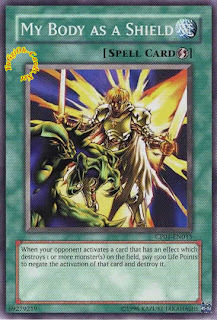 If its Mirror Force, just bring out boss monkey and revive Prime Material Dragon, then discard one from hand and destroy. BY now you will have 2 cards in hand (one from Norleras, and one recently drawn at draw phase) so it will be okay. I wonder if anyone will make a variant that can draw out the deck in whole turn to FTK or something. It would be cool though. If you start first, you pass. Then second turn draw whole deck, get heavy and kill. Then play your lightning vortex/ any form of monster removal (But not Norleras as its suicidal (unless needed!)) then summon all the boss monkeys and do so. Hmmm. Lazy to think about how to make a deck like that now. Erin Diaz's Ohm FTK is a good example as well as Baha's old EMOBC. I might run Burial. But dunno what to take out for it actually. Burial helps with Phantom, REDMD, wyvern, necro and too much la actually. Necro in there is for fun. Lightlord abuse- true story. Its to stop you from dying before killing with your boss monkey. The bombing of Phantom is really useful la. They cant bottomless you and if they solemn it, its okay as you just make it even easier to kill them. The only thing that worries me is Skill Drain or the pesky chariot. Before i end, I greatly urge every player to read this article by Jason Grebher Meyer. It really opened my eyes and reminded me of things that I had totally forgot. You'll become a player after you read this =) Its a must read. Side note: Burden of the Mighty = annoying! Okay came across this deck at TCG player.com and I was quite amazed by it. It looks inconsistent but the deck creator (Ice-Eyes) claims that it isnt and it is surprisingly consistent and mediocre and explosive. Actually, Im very amazed that he has meshed 3 of the biggest decks in one for a Synchro Beats deck. I have no idea how consistent it is or if it isnt so dont simply say that i claim it is. I believe it is as there are probabilities and quite a huge lot of potential in it. 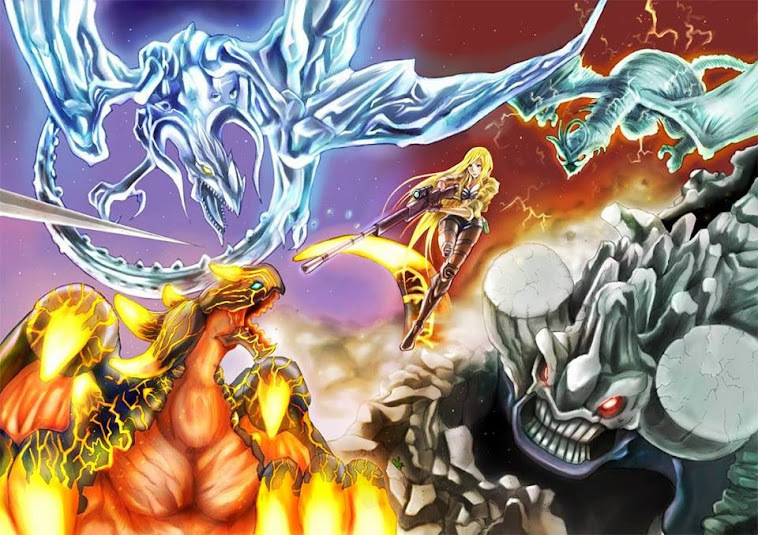 Credits to Ice-eyes from TCGPLAYER.com and here's the link to the forum threas if you guys want to read the comments/fixes/reasoning etc. I can see it as a very synergious deck to play and its nice. Very nice. Hmmm. Of course the main good thing about the deck is that if it fights standard LS/twilight, it will be on par(possible better) as the its faster and it has Necro Gardna to prevent attacks. Then it can get to synchros easily too. VERY easily. The only downside is that against Skill Drain, it is gonna scrub badly BUTif you have god luck and for some reason you didnt mill heavy storm away, you're safe =) But possibility of Dark Bribe, and God's Declaration and suddenly you scoop =)Without Honest, Barbaros is the last thing you wanna see on the field. For me, I have none of those cards so Im not gonna test it out. Lazy to test it out by proxying too and personally, i have no interest in that deck, as the price in unmentionable. Unless someone give me for birthday then can lah....Maybe I will test it out on Stardust Accelator game? Dunno too. Just started downloadin the illegal one from Romulation to play. Hehe. Apart from its totally cool name, it's obviously one of the best cards to play in the game right now. While it is safe to say that each deck runs at least a number of destruction cards, (in every meta deck: destruction is everywhere: in the form of micromanagement or macro management) but is it safe to say that we are prepared for it? We all fear our combos that need to be set up being destroyed, we all want our cards to be safe, what is the best option out there? It's no doubt My Body As a Shield. Blackwings are famous for its Black Whirlwind combo and if its opponent forks out trap hole, Bottomless Trap Hole or something of that sort, what can you do? You lose a card and you do not benefit from Whirlwind's effect, so how? Answer is simple: My body as a shield. You fear mirror force, Lightning vortex, torrential tribute etc? Simple again: My body as a shield. What about that Gyzarus play your opponent is setting up? Or Celestia? Simple: the answer is there. If you successfully negate and destroy Gyzarus/celestia, your opponent has just lost field presence and massive card advantage. 1500 LP for that? I think its massive card advantage as it can prevent complete change of tempo within the game. The famous Gemini Spark is a combo that lets you sacrifice a Gemini monster to destroy 1 card on your field and draw 1 card. Play My Body as a shield. You lose a card(my body) and 1500 life points. In turn, your opponent has lost 2: Spark and the monster. Usually 2 cards is a hit for the opponent as the average number of cards a player has per turn is about 3-5. 2 is a big killer as that Gemini Spark could have helped him destroy something that he really needed and then he would have picked up a useful card from his deck. It also can allow complete tempo change in the game : (in your favour of course!) No longer are you worried about your combo being destroyed. Its extremely versatile and it gives you peace of mind to duel without making mistakes. But the best part about My Body As a Shield comes in the form of anti meta builds. MBAS truly shines in these decks. Why? Quite simple actually. Think about it, most anti meta builds run a low count of monster as they want access to spells/traps to shut of the opponent. Then, this low count of monsters is extremely important as the the downside of runnin anti meta is you have less monsters compared to opponent. But, you have your spells and traps to handle that threat. Now what if your opponent flips up an unexpected Mirror Force or Torrential to change the tempo of the game. Having a monster count of about 12 to 14 isnt gonna help as that severely lowers your percentage and chances of drawing monsters next turn. My Body is so good that it can prevent this threat from happening. With protection and monster presence, and cards that eleiminate your opponent's monsters presence: what more could you ask for? Now MBAS is often referred as the new solemn. It is cool to witness solemn wars again :D Take note that MBAS actually "destroys" cards in the process, so you can chain MBAS to another copy if the target is a monster. Take note that MBAS cannot negate Royal Oppresion's effect (as this is a commonly widespread mistake) Its because Oppression negates the monster special summon. Because it actually prevents the monsters from being summoned, the monster HAS NOT REACHED the field yet so it is invalid. At least half the players in the top 16 of SJ Colombus ran MBAS in their main decks and sidedecks. Jeff Jones even took the liberty of running 2 in his main deck. This era of anti meta is a use of anti meta as a Meta deck, and as such you need to reduce variables and make your plays as brainless as possible. What can I say, it works. Today's topic is random as I have nothing much to update. No its not about the card above its a terrible card but what caught my eye is the picture. Isnt that Kycoo the Ghost Desteroyer?? Woah he looks mighty scary all right! 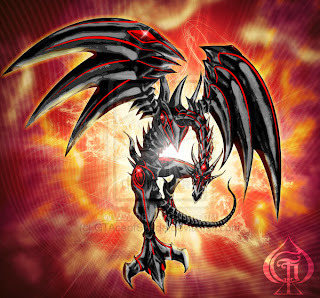 In fact his attack sounds cooler than Blue eyes' burst stream, or Red Eyes' Inferno something something,,,, and its definitely better than Red demon dragon's absolute powerforce. This one sounds so cool man, i mean "Eternal Rest!" is like puttin the opponent monster to sleep forever or something. I guess thats why Kycoo removes monsters from the game as it is "Eternal" rest after all and they will never come back...Except for you know...But I wonder why Kycoo doesnt have the half scar on the face in that picture. Is there a story to that? I'd like to know. Seems like Asian Qualifiers in Singapore was so terror. you can come here to read it. Thank God at least Malaysia got proper organisers and stuff and is not "one sided". Poor baha, no i mean poor Singaporeans. Seems like the first place deck is Lightsworn. Hopefully in Malaysia it will be Black Feather- I'm rooting for them ah. Seems like no anti meta or DDGB strategy prevailed. LGQ is right. Anti Meta has a tendency or some "curse" to lose in every tourney. Quite true also wor. Its generally more inconsistent than all the other meta decks. WHY? It lacks SYNERGY. All bout countering moves and simplifying the game. In tourneys, sure got "good luck" draw hand that 50% is monsters. How le? Die lo. All the cards ALMOST HAVE NO SYNERGY. You may argue that some anti meta builds do have synergy. True also, but can compare to meta builds mah? No, like nothing. Some people may argue also why some crappy decks make it to the top8/top 16 in certain tourneys. They look at the decklist and say lousy and whatsoever (quotes ken: Looks like a kid make that deck!). There's the beauty of the Sword is Mightier than the Pen. You see, the deck in action is more important than the decklist you write. Some decklists look good but when you play it, its like.....meh. That almost explains why random decks like the Ryan Spicer Alchemist Chaos build can actually run well in the past few SJs. After watching GX series and readin the manga again, I fell in love with my old deck: E-hero! Wish can play it again T_T :( so fun to ram people with absolute zero or pulling off FlameWingman for the win, ala-Judai. T_T Now E-hero so keng ah got many versions and DivaZero is like the most fun deck to play out there I think. Nostalgia. 3) message 016-5227501 n tell me. I will send cards by PosLaju as its super-efficient or if the deal concerns money, just tell me your bank acc and I'll debit it. Oh if you're Singaporean or of other nationality and you are coming to Malaysia between 9th December to 14th Dec, just tell me and we'll go Sungei wang and find. Maybe I'll ask my parents for the 2 copies of that big duel disk for Christmas present hehe =D then can get my starlight roads. Maybe want find 3 vice dragon or 3 priest of the sun...hmmm. I think priest better la at least he's light. 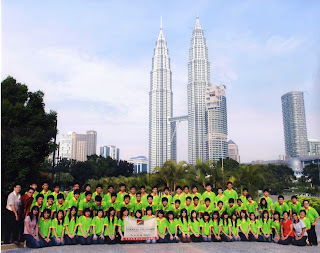 Nah for those wondering how I look like, go see my KL picture with whole group. Starlight Road is gaining popularity. HMMM. I was very wrong then. Again brings us back to the motion: Terribad on paper, but good in action. Ahhhh. I still prefer My Body As A Shield though. Random: I wan make Black Feather! Collectin cards n tryin to find now....If you r malaysian n have BF pls go tagbox n tell me ur price. After waking up at 7am just to go to school and judge the school debate, feel so sien le. The Secondary 1 students were attrocious and horrible I feel like shouting -.- One called studs "gold balls" and that student was a girl. WTF man how can she dunno she herself uses it. -.- And apparently their english is terrible too because they called a person who rapes "a rapper". We stared and lifted our eyebrows and the poor girl (luckily!) realised her mistake and corrected it. Needless to say, remember this (for Malaysians only)- Not all private school english is very damn keng and pro. Refer to above and you will laugh. There are a whole lot more things and they were really below par and disappointed us. How to find potentials for Swinburne Debate? I also dunno. siens. Childish too. Gah! You people may wonder why the hell I'm judging a debate tourney and think to yourselves: WTH since when does Michael here debate????!!! so yeah, now u know, i debate >.Proof of Powerlessness. If you control a level 7 or higher monster on your field, you may destroy all face up level 5 or lower monsters on your opponent field. Your monsters cannot attack this turn. I think this is one of the cards that provide ALMOST-free destruction. It is situational because you need to control level 7 monsters, but I think the deck that is gonna benefit most from this is Cosmos and Skill Drain Barbaros simply because they are constantly full of high level monsters- ranging from Guardian Eatos, Barbaros, and Fusilier which are all run in multiples. Of course you could argue that your opponent could chain a card to rid the presence of your level 7 monster but then again, all cards have its drawback and all combos are prone to that threat. * It should be used in ur opponent's turn to avoid loss of advantage through permission to attack. It's definitely surprising to pull this card off. Free destruction- I'm not complaining :-l I'd like to use it to destroy those little Gladiator Beasts on the field wahahahahaha and maybe stop Magoushin (Demon Roar God) from coming clean with the little cute beasts. Its a GB killer and Cosmos plus SDB players, you can try teching this card around. Plot of the Piano Tuner. 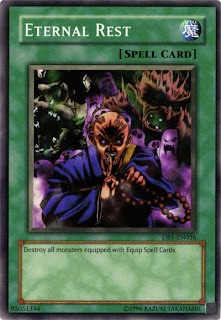 Continuous Trap Card: When a synchro monster is special summoned to your opponent's field, you may take control of it. If it is destroyed, it is REMOVED FROM PLAY. When it is removed from the field, destroy this card too. Thats all for today lazy to post long long le cause feel so tired and sien. Tonight might be wan karaoke again. =_= sien. Oh! one more thing: here are 2 very interesting decks that I saw on Shriek. Here are the links as Im lazy to type out. Now after you read the 1st deck, the question I ask you guys is: Are old era decks good enough to take on the meta? Effect: Send 1 continuous trap card you control and draw 2 cards. 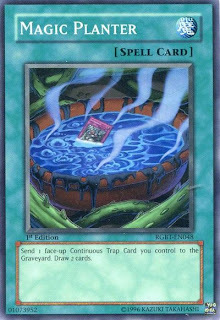 In skill drain, oppresion-related decks have you ever found out that you get repeated copies of certain cards? I know I do. Especially in Cosmos decks I find that my cosmos keep repeating. Furthermore, anti-meta decks are slow and have almost no draw speed. Think about it. This is a destiny draw in hand. I think anti meta decks that max oppresion and drain should run this definitely. With 6 targets, and one more: probably call of the haunted, oh my god, this is good. Sometimes, you also find that ur skill drain is negating ur monster effect that you really need to use. Easy. Turn it into magic planter food. There's a chance that you draw skill drain/ oppresion again later. Time to tech 2 in my barbaros oppresion drain. Sexiest Monster: Obviously Dark Magician Girl. She still beats Nurse Angel Lily, D.D Warrior Lady, E-hero Burst Lady and such. I like the anniversary version best still. :l Harpie Lady girl may be cute, but DMG still more classical and desirable than her. Later got painful bird claws and God Bird Attack. Sexiest YGO original character: Mai Kujaku. Anybody who thinks its Anzu (Tea) has bad taste. Sexiest GX character: Tenjoin Asuka is smoking. The adult Rei become quite cute le. Sexiest 5ds character: Probably Aki. If only she was more feminine. Now what do you guys think? Opinions in tagbox or comments please. Next time: Looks good but is it good? Looks bad but is it bad? The deck's somewhat D.D Eatos so nothing special. Still its highlighted here for netdeckers and its an interesting sort of MetaBeat. Lazy2 type decklist out so copied it from ペンギン-Sama(clarence)'s blog and pasted here. Looks like I was wrong about Starlight Road. Still, maybe it was made just for this deck. I still think its a terribad overrated card, well at least for this current format. I also like that guy's idea of not running any Synchros except for 3 Stardusts and preferred to run old Fusion Staples from the good old days! Way to go for mocking synchros!